One more to write and then I'm all caught up on Family Home Evening posts! Hooray! Alright, this last week's FHE was number 46/47 based on the Gospel Principles manual, chapter 46: The Final Judgement. Where love is, there God is also. Where love is, we want to be. Where love is, there God is also. We think of him rev'rently. Teach us to pray, to talk with him above And know that he will guide us with his love. The happiness we feel when love has found us, 'Tis love we get when love we bring. Where love is, there God is also. And with him we want to be. 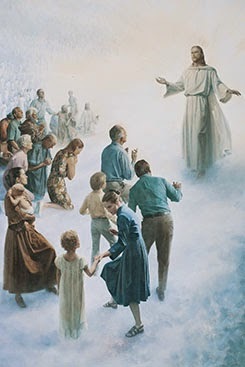 Show us the way and guide us tenderly That we may dwell with him eternally. Lesson: We are often told in the scriptures that the day will come when we will stand before God and be judged. The scriptures teach that all of us will be judged according to our works: “And I saw the dead, small and great, stand before God; and the books were opened: and another book was opened, which is the book of life: and the dead were judged out of those things which were written in the books, according to their works” (Revelation 20:12; see also D&C 76:111; 1 Nephi 15:32; Abraham 3:25–28). We will also be judged “according to the desire of [our] hearts” (D&C 137:9; see also Alma 41:3). The prophet Alma testified, “Our words will condemn us, yea, all our works will condemn us; … and our thoughts will also condemn us” (Alma 12:14). Faith in Jesus Christ helps us be prepared for the Final Judgment. Through faithful discipleship to Him and repentance of all our sins, we can be forgiven for our sins and become pure and holy so that we can dwell in the presence of God. As we repent of our sins, giving up every impure thought and act, the Holy Ghost will change our hearts so we no longer have even the desire to sin (see Mosiah 5:2). Then when we are judged, we will be found ready to enter into God’s presence. At the Final Judgment we will inherit a place in the kingdom for which we are prepared. The scriptures teach of three kingdoms of glory—the celestial kingdom, the terrestrial kingdom, and the telestial kingdom (see D&C 88:20–32). “They are they who received the testimony of Jesus, and believed on his name and were baptized, … that by keeping the commandments they might be washed and cleansed from all their sins, and receive the Holy Spirit.” These are they who overcome the world by their faith. They are just and true so that the Holy Ghost can seal their blessings upon them. (See D&C 76:51–53.) Those who inherit the highest degree of the celestial kingdom, who become gods, must also have been married for eternity in the temple (see D&C 131:1–4). All who inherit the celestial kingdom will live with Heavenly Father and Jesus Christ forever (see D&C 76:62). In reality, every day is a day of judgment. We speak, think, and act according to celestial, terrestrial, or telestial law. Our faith in Jesus Christ, as shown by our daily actions, determines which kingdom we will inherit. 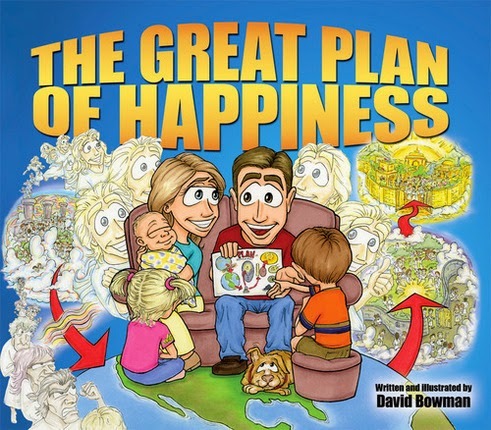 Activity: I read the book The Great Plan of Happiness by David Bowman. This book came with a map of the Plan of Salvation. Using this map, June and I walked around the house where I had three rooms set up as each of the kingdoms of glory. For the telestial kingdom, I strung up some white Christmas lights to symbolize the glory of the stars. For the terrestrial kingdom I had one bright lamp turned on to symbolize the glory of the moon. And for the celestial kingdom, I had all the lights turned on in a room to symbolize the glory of the sun. I also had pictures of family, Christ, and temples up in this room to show how in the celestial kingdom we are with our families. As we visited each room, I described the kingdom to June and told her who will inhabit each. Her favorite part of this game was following the map and exploring what Mommy did to each room.